Welcome to our website! We are Mark and Cindi and we live in Texas. We got tired of tent camping and sleeping on the ground so we built a teardrop trailer to camp in. We first got the idea after watching the show RV Crazy on the Travel Channel one evening. Then we found the Teardrops & Tiny Travel Trailers forum and we were hooked. Every teardrop needs a name so we named ours Little Switzerland (later changed to Little Swiss Teardrop). Cindi's ancestors came to the USA from Switzerland in the mid 1800s and they settled in middle Tennessee where Cindi grew up. We have been to Switzerland many times over the years and it is our favorite place to visit. 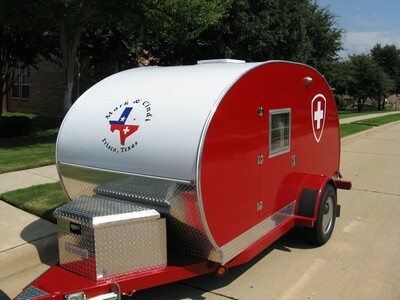 Little Swiss Teardrop has a Swiss theme (of course). We have posted pictures of our build here and continue to post pictures of our outings. Welcome aboard and enjoy the pictures.